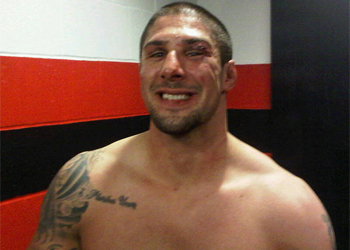 Brendan Schaub has been aggressively petitioning for a fight with MMA legend Antonio Rodrigo Nogueira. Today, the world’s biggest MMA promotion granted the up-and-comer his wish by announcing the heavyweights will do battle at “UFC 134: Rio” on August 27th. Nogueira holds an accomplished 32-6-1 professional record. The former Pride and UFC interim champion hasn’t been seen since losing to Cain Velasquez at UFC 110 in February 2010. He was slated to rematch Frank Mir at UFC 119, but “Big Nog” was forced to withdraw to undergo knee and hip surgery. Since winning his first pair of Octagon scraps, the 34-year-old jiu jitsu specialist has now dropped two of his last three bouts. Schaub dons an impressive 8-1 resume, with all but one of his wins coming by way of devastating finish. “The Hybrid” is riding a four-fight winning streak, with his most recent highlight reel moment coming in a knockout of Mirko “Cro Cop” Filipovic at UFC 128 this past March.